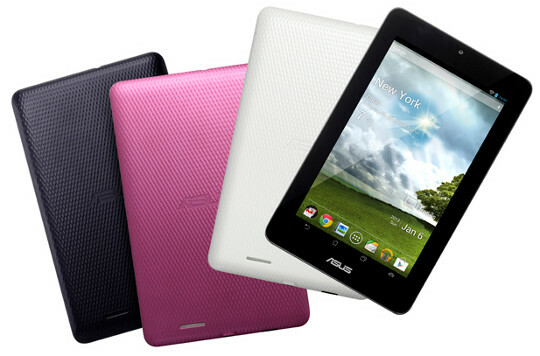 Asus has unveiled the Asus Memo Pad, a 7-inch budget-friendly Android tablet that runs Android 4.1 Jelly Bean. The specs are a little disappointing, but the $149 price tag is certainly appealing. Many thought this tablet would be a competitor to the Google Nexus 7 (which Asus also makes) and Kindle Fire HD, but it turns out it’s more in line with last year’s Kindle Fire that now sells for $159. The Asus MeMo Pad has 7-inch LCD display with 10-point capacitive touch and a resolution of 1024 x 600. It doesn’t have the high-res screen like the Nexus 7 and Kindle Fire HD, but unlike those two tablets it does include a microSD card slot, and works with cards up to 32GB. Base storage space is either 8GB or 16GB (Asus says it may vary by country). Other specs include 1G of RAM, a 1 megapixel front-facing camera, headphone/mic jack, micro USB port, speaker, 2.4GHz Wi-Fi, and 7 hour battery life. The MeMO Pad runs Android 4.1 Jelly Bean and is powered by a 1Ghz VIA MW8950 CPU and a Mali-400 GPU. The Asus MeMo Pad weighs in at 358 grams and measures 196.2 x 119.2 x 11.2 mm. It comes in three different colors: Sugar White, Titanium Gray, and Cherry Pink. The MeMo Pad also comes bundled with Asus’ collection of Android applications, which are quite nice as I’ve used many of them with the Asus Transformer tablets. There’s a pretty good ePub ereading app, a handy SuperNote app, Asus sync and web storage, there’s an app locker, app backup, and others. Asus hasn’t given an exact date of release yet, but the Asus MeMo Pad is expected to start hitting retailer’s shelves soon. It’s a pity it doesn’t have a higher resolution screen, but it’s still a good price for a budget tablet compared to what else is out there. It would have done a lot better if they’d released it a year ago. It sounds like a competitor to the Lenova Ideapad 7, although I haven’t reviewed its specs or price in a while. So no Bluetooth. Leaving off Bluetooth must be a significant cost saver because why else leave it off on so many tablets. Here is the lenova for $159 that includes rear camera, bluetooth, half the RAM, and slightly older OS. The bluetooth thing is certainly a savings consideration, but not because of the hardware. The adapter and antenna can be added for a couple of bucks. The money issue is in developing functional support within the custom Android build for that particular hardware setup. Doesn’t seem like it would cost much, but the entire package has to effectively be rebuilt, with the hopes that bluetooth support didn’t kill something else. Leaving it out saves money and gets the product out more quickly. This appeals to me. The price is right and you can add memory. Looking forward to hearing more about this tablet. I don’t know. For $50 more you could get a Nexus 7 16GB with specs that blow this out of the water. Indeed. The addition of a memory card slot will probably be a factor for some folks, though. I wish Asus would have used a 1280 x 800 screen instead. Then it would be a good deal. I don’t know . . . Asus is a little late to the party with this model. Or keep things as they are and shave $30-$50 from the price… then it’s competitive with higher-end tablets. I could see myself purchasing this as well. I don’t need bluetooth and It doesn’t bother me that It won’t have a high res screen. I do like the fact that It will be able to use micro SD cards and you simply can’t beat that price point.